This past week, NAICU, the National Association of Independent Colleges and Universities held their Annual Meeting in Washington, D.C. with time alloted for Hill visits. A dozen independent college presidents took heed and met with Senator Voinovich's office, Senator Brown and staff (pictured), and the staff of freshman Congresswoman, Marcia Fudge from the Cleveland area. The meetings, which centered around the importance of the proposed increase in Pell Grant aid to students and the inclusion of independent colleges in the construction dollars through the Federal Economic Stimulus package went very well. 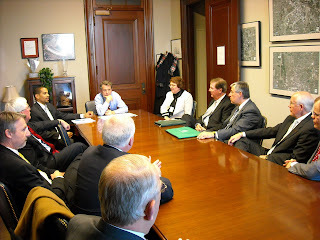 The senators and staff were very engaging and understood our concerns. The stimulus package is currently being debated in the Senate and is expected to be moved shortly.